An important characteristic of this family is the wooly combed catching silk, which often has a shiny blue color. It is a cribellate web. 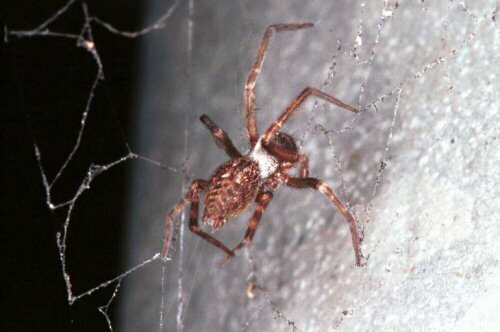 The spider combs its silk with a comb or calamistrum located on her rear legs. The comb is made of a row of small, stiff hairs. 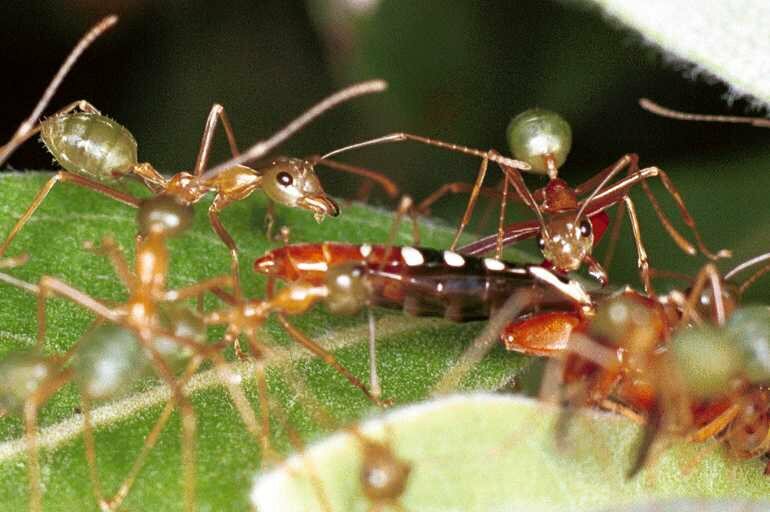 The silk comes from an organ called the cribellum and contains of a lot of small spinnerets that deliver the small threads of silk. 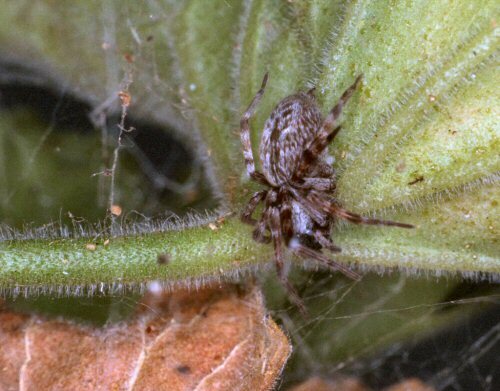 All spiders with a cribellum (Amaurobiidae, Eresidae, Oecobiidae Uloboridae and Dictynidae) are incorporated in a special group called the Cribellatae. How does this wooly catching silk work? Around two closely located normal catching threads lies the wooly, combed catching threads. When an insect comes in contact with the wooly web, the barbed hooks of the insect get meshed in to the wooly silk. The threads of the wooly silk can stretch to ten times its original size. Therefore as the insect tries to free itself from the silk, it finds itself more and more snarled up into the mesh of the silk that keeps on stretching. All this time the spider is watching the show. After the insect is debilitated, the spider makes its move and kills the prey. This is a robust short-legged spider that can be found around houses. Most of the 18 species are dark in color, often with a lighter or darker pattern on the abdomen. 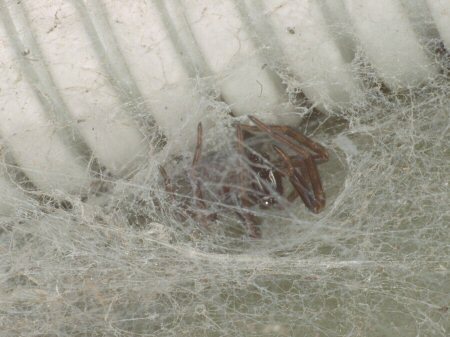 These spiders are also called house-spiders that can be found in and around building. 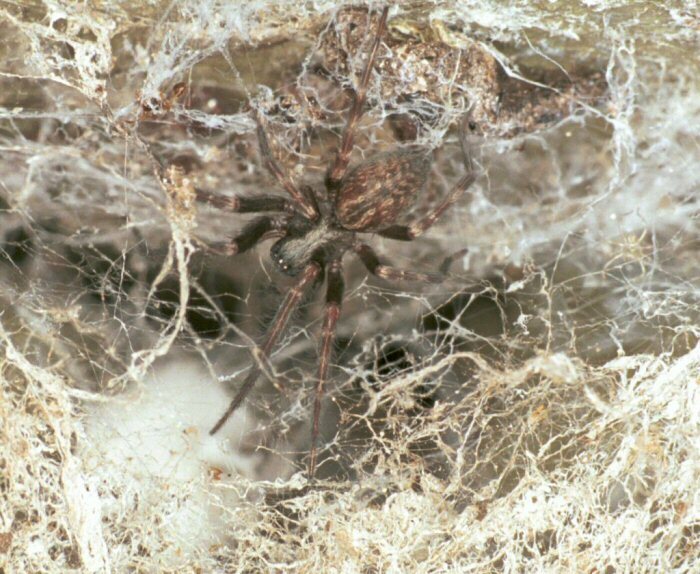 Old webs become dense, felted and gray in appearance. Care should be taken in handling the spider because its bite is poisonous but not lethal. Badumna insignis (formely Ixeuticus robustus ) Badumna insignis in her retreat waiting for a prey that gets entangled in her web. 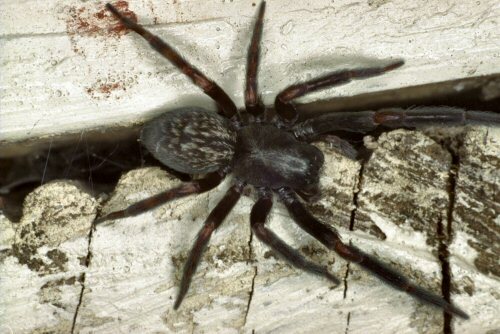 Badumna insignis is known as the Black house or window spider. The male has a length of 10-12 mm and the female 16-20 mm. They like to build their permanent web inside houses as her name suggests. Her web has a tubular retreat which spread out in a series of broad funnels. She is therefore sometimes, inaccurately, called Funnel-web spider. The web can measure up to 35 cm. The female make oval egg-sacs.